LACo OL (Ret. ), Mark Verge, named CEO of Santa Anita Park! 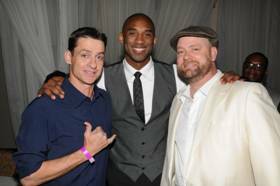 ARCADIA, Calif. (April 24, 2012)—Kobe Bryant and Pau Gasol had a night off Tuesday, but that didn’t prevent the two Lakers stars from indulging in some good old fashioned horse trading at Riviera Country Club. 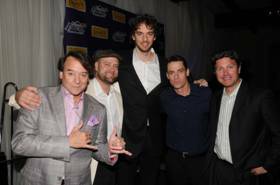 In fact, when the Lakers Foundation fund raiser concluded, Bryant and Gasol emerged as ownership partners on a Thoroughbred gelding named Siempre Mio, courtesy of Santa Anita C.E.O. Mark Verge. “All of the money that was donated last night will go to benefit the Lakers Youth Foundation and Santa Anita is proud to support their programs,” said Verge. Gasol, a native of Spain, was apparently enamored with the horse’s name. A 4-year-old California-bred gelding by Dixie Union, Siempre Mio broke his maiden by 2 1Ž4 lengths when running for a $20,000 claiming tag on March 31. Ridden by Joy Scott, Siempre Mio is trained by Doug O’Neill and owned by Verge’s WestsideRentals.com and (Santa Anita Vice President of Sales and Marketing) Chris Quinn. Although Tuesday’s auction results appear to be a Lakers first, the Sport of Kings is certainly not new to purple and gold management as owner Jerry Buss has owned several horses along with his partner Frank Mariani over the years. Jerry’s son (Laker’s Executive Vice President, Player Personnel) Jim Buss was a licensed Thoroughbred trainer for a number of years in California. Santa Anita’s 2012 Autumn Meet will begin in late September and be highlighted by the Breeders’ Cup World Championships, which will be run Nov. 2 and 3. For more information, visit www.santaanita.com, or call (626) 574-RACE. 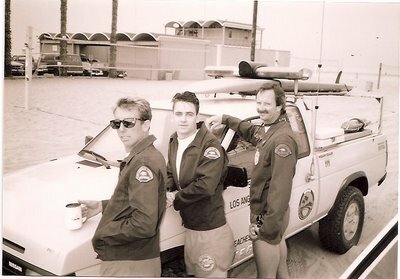 Editor's note: Mark Verge worked as a LACo Recurrent Beach Lifeguard on Santa Monica South in the mid to late 1980's on schedule with the likes of other notorious SMS recurrents like Mike Crews, Bill Wilson, Ivan Wilkins, Craig Hummer, Steve Hotchkiss, Durrell Rittenberg, Tim McNulty, the undersigned, plus OLS' Bill Dederick and Dan Atkins, plus then Lt. Ira Gruber, just to name a few. Mark is also the younger brother of Veteran LACo Recurrent Arthur C. Verge and the son of retired Santa Monica City beach lifeguard/Santa Monica College History Professor, Emeritus, Art Verge. Below is a photo of Mark from the Summer of 1988 with OLS Dave Estey at left and OLS Bill Powers at right, during the annual summer Central Section Crew photo shoot (Photo by Will Maguire). Tony Cornero was a notorious bootlegger during prohibition, and a gambling entrepreneur during the 1930’s into the 40’s. “Tony the Hat” circumvented California’s anti gambling laws by anchoring two luxury casino vessels in international waters three miles off the coast, one moored off Long Beach and the “S.S. Rex” off Santa Monica. The Rex could be reached by water taxi from the end of the Santa Monica Pier, and was a very popular attraction for numerous shady characters and deep pocket, wealthy customers. It had a crew of 350, including waitresses, gourmet chefs, a full orchestra, and a squad of gunmen. $300,000 a night was the average take. One evening before nightfall a group of dark suited men came onto the beach and approached an off duty beach lifeguard with a proposition. Would he be willing to row one of them out to the Rex, wait for him and then return him to shore for a fee? Well, three miles out and three miles back was a pretty good paddle but maybe not for a dory man. I could name a couple of our lifeguards that have rowed all the way from the islands to the California shore let alone a mere six miles. Now in the late 1930’s beach lifeguards were paid about 75 cents an hour and I was making 35cents an hour as a Venice Salt Water Plunge Lifeguard at the time. So our un-named lifeguard, a great guy who many of us worked with on the beach for many years, agreed, but all the time he wondered why this guy just didn’t take the water taxi like everybody else. Obviously he didn’t want to be seen or give his name at the check in for some serious reasons. Luckily it was a calm evening and the trip out went without incident, but any attempts at small talk on the journey were to no avail, the passenger uttered not a word. The man in the dark suit boarded the Rex and a half hour passed before his return. Our lifeguard reported later that he heard no gunshots during the interval but it was noisy with the water sloshing alongside the Rex. The man was carrying something under his arm when he climbed back aboard. On the trip in our lifeguard again thought of asking a question or two, but when he thought he saw a telltale bulge under the man’s jacket he decided that it would not be a good idea and maybe they just might want to get rid of the witness. With little surf running the dark suited man barely got his shoes wet climbing out of the boat and joining his equally dark suited friends on the beach. A wad of bills was pressed into our lifeguard’s hand, and with no conversation involved the men hurried to their parked car on the beach road and were off. Well, all in a day’s work thought our un-named lifeguard, but what he discovered in his hand when he looked down was more like a month’s work. P.S. A couple of years later the Rex was raided by the authorities on several coast guard boats, a fight broke out, fire hoses were turned on the police, and it took three days to get “Tony the Hat “ to surrender and be arrested. "Get In Shape Now, Ask Burnside How!..." April Showers: Wet, Wild and Windy"!